Featuring a Q&A session with Ryan Martin moderated by Dr. Feranmi Okanlami. The first 100 attendees receive a free popcorn and soft drink! This TED-style event allows students, faculty, and staff to share their personal experiences with disabilities and raise awareness of accessibility, mental health, and other differences in an inclusive, supportive, educational environment. 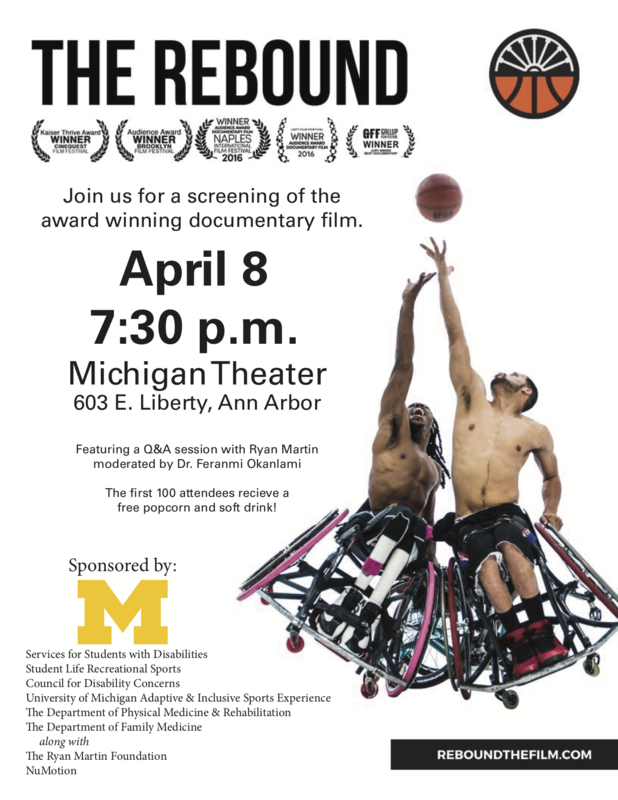 Organized by disabled students and students with disabilities from the Services for Students with Disabilities (SSD) Student Advisory Board, this annual event is a great way for individuals to share their experiences with members of the campus and Ann Arbor community. Come join us for a couple minutes or a couple hours! WHEN: Thursday, March 21st from 6:00-8:30 pm. Learn more about U-M’s upcoming university-wide reaccreditation with the Higher Learning Commission (HLC) and share your thoughts about the materials that the University is preparing for this process.  U-M’s accreditation team will be hosting town hall events in March to gather further input on the University’s draft response to the HLC. In addition to staff, we encourage students and student advisory board members to attend these meetings as well. 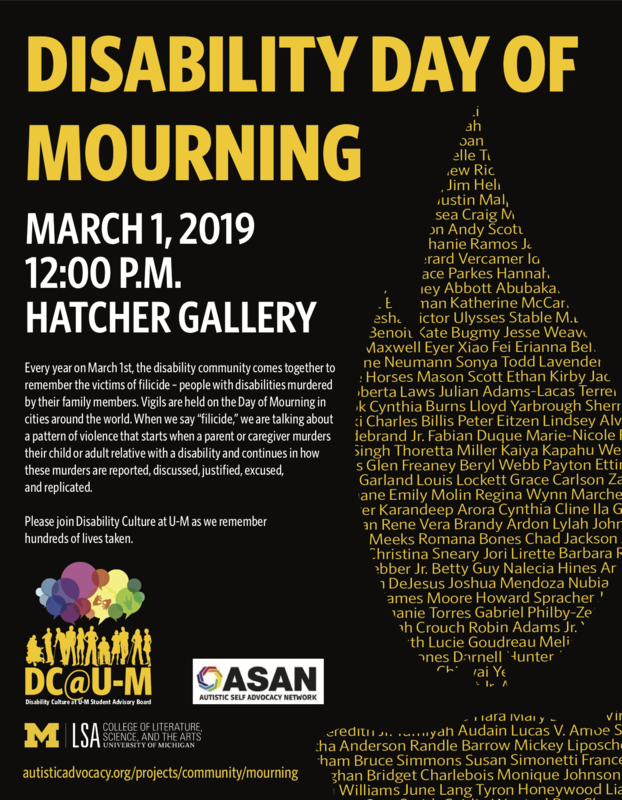 Every year on March 1st, the disability community comes together to remember the victims of filicide - people with disabilities murdered by their family members. Vigils are held on the Day of Mourning in cities around the world. When we say "filicide," we are talking about a pattern of violence that starts when a parent or caregiver murders their child or adult relative with a disability and continues in how these murders are reported, discussed, justified, excused, and replicated. Please join Disability Culture at U-M as we remember hundreds of lives taken. The Allies for Inclusion 90-minute workshop is offered to faculty, staff and students who want to learn more about disability-related issues and are interested in becoming disability allies. The exhibit is open Wednesday, February 27, 9 a.m.-4 p.m., & Thursday, February 28, 8:30 a.m.-4 p.m. The workshop is Wednesday, February 27, 10-11:30 a.m.